1 November 2017 Where the Sunrise is Red has been released in Malaysia and Singapore. It will be in the UK in early 2018. 1 April 2016: Chan Ling met with a book club in Valencia to discuss the background to the novel, A Flash of Water. February 2016: A Flash of Water was released in the UK and elsewhere. 30 October 2015: Chan Ling’s new novel A Flash of Water was released in Asia. 19 March 2015: Chinnor’s U3A hosted a talk by Chan Ling at the Chinnor Village Hall, Church Road, Chinnor, Oxon at 14.00. 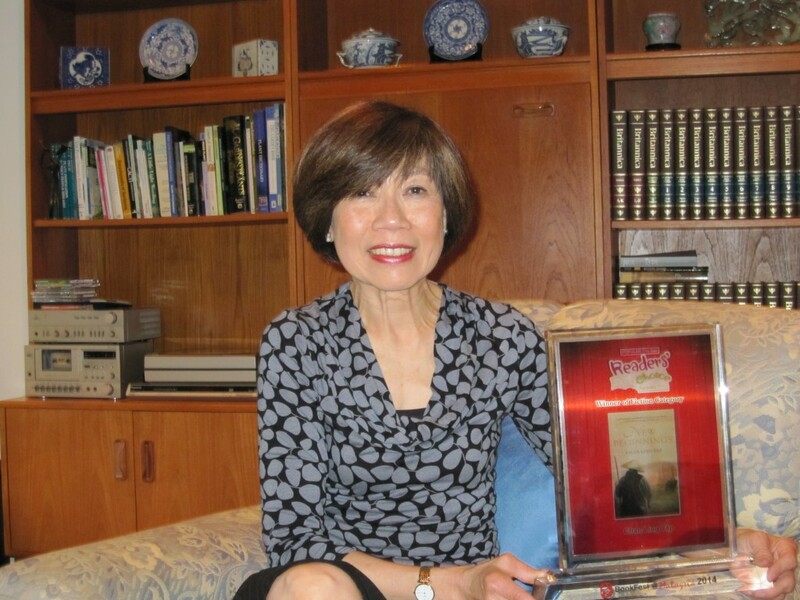 2 October 2014: The Wendover Library hosted a talk by Chan LIng. 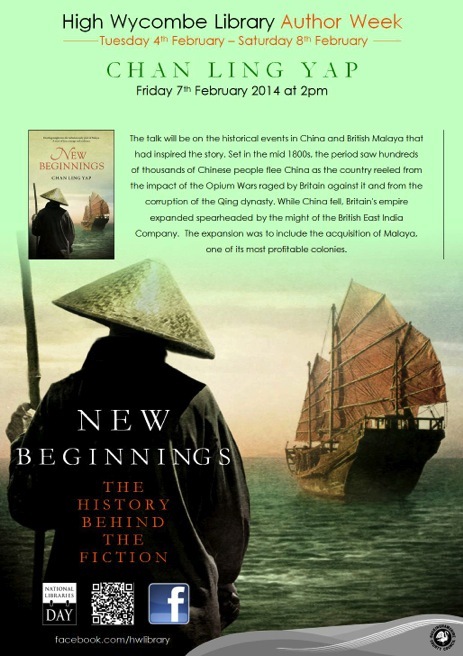 2 August 2014: New Beginnings won the 2014 Star Readers’ Popular Choice Award for fiction. 8 April 2014: Chan Ling visited the London Book Fair where her three novels Sweet Offerings, Bitter-Sweet Harvest and New Beginnings were presented. New Beginnings, now in its second print run, has been nominated for the 2014 Popular Readers’ Choice Award in Singapore/Malaysia. 7 February 2014: The talk, “New Beginnings, the history behind the fiction” at the High Wycombe Library, 45 Eden Place, High Wycombe, HP11 2DH was very well attended. Lots of questions and discussions followed and the session went well over the hour allocated. Chan Ling would like to thank all those who attended and supported the event. January 2014: New Beginnings became one of the top ten best sellers in Malaysia. 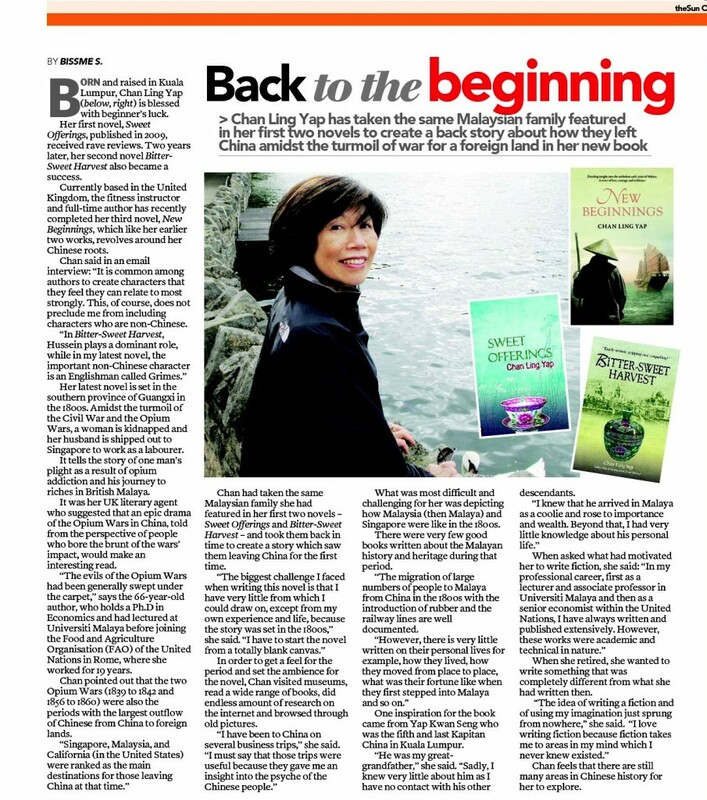 New novel: Chan Ling’s third novel, New Beginnings, is now released. The story is set in the mid 1800s during the time of the Opium Wars and Taiping Rebellion in China, which saw the largest outflow of Chinese from mainland China. It traces the life of one Chinese immigrant to Malaysia, his rise from anguish and despair to become one of the most powerful man in the country. For more details click on to New Beginnings. 24 May 2013: Chan Ling gave a talk to the Bourne End Life Style Group at the Bourne End Library. On 4 April 2013 Chan Ling made a presentation on the inspirations and settings for her novels to the U3A Travel and History Group in Princes Risborough. The talk, held at the Community Centre, was attended by over fifty people. 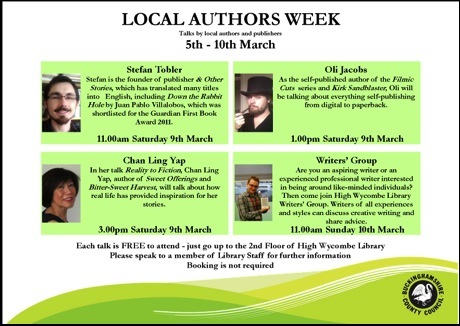 Authors’ Week: On 9 March 2013 Chan Ling gave a talk on “Reality to Fiction” on Saturday 9 March at 15.00 in High Wycombe Library, 5 Eden Place, High Wycombe, HP11 2DH.